Blogging Tips: How many incoming links does your blog have? In the blogging world, links that direct people to your site are like gold. They mean more visitors, which means more followers, more comments, more tweets, and for some, more money. It is nice to know when other bloggers link back to you, and it’s fun to see your blog’s popularity grow. By using Webmaster Tools, there is a very simple way to see how many links are out there in the wide web that bring people to your site. First, you need a Webmaster Tools account. Since it is run by Google, if you have a Google account, you’re golden. If not, you will need to register for one before you can proceed. Once you are all signed in, you need to add your website. Google has a good tutorial on how to do this here. Once you have added your website, there is a simple way to check your incoming links. That’s it! I find it really helpful for seeing who else has linked to my site so I can give them a link back. Did you find this helpful? Pin it so other people can use it too! 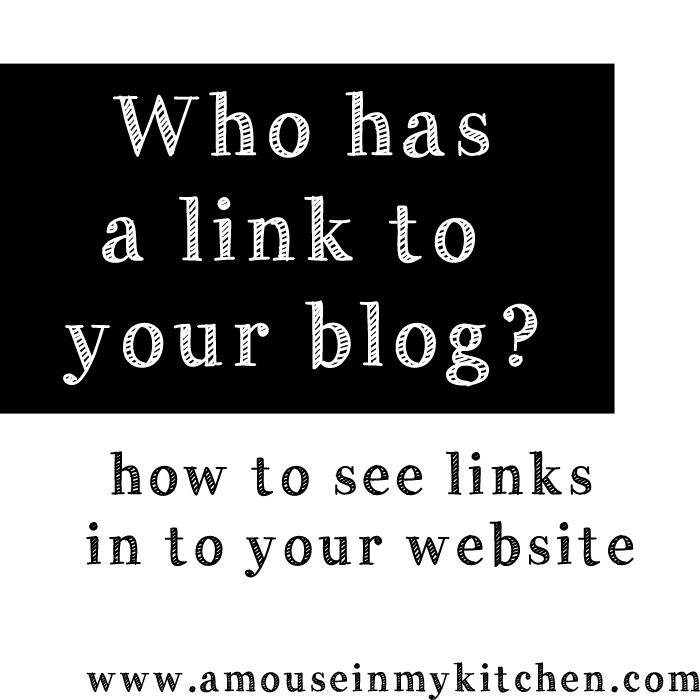 402 Commentshttp%3A%2F%2Fwww.amouseinmykitchen.com%2F2013%2F04%2Fblogging-tips-how-many-links-does-your-2.htmlBlogging+Tips%3A+How+many+incoming+links+does+your+blog+have%3F2013-04-12+21%3A00%3A00Markellhttp%3A%2F%2Famouseinmykitchen.com%2Fblogging-tips-how-many-incoming-links-does-your-blog-have%2F so far. Feel free to join this conversation. haha that's awesome. It's good to check once in awhile, sometimes you get mentioned and never know it!